This is a list of dogs that possess the ability to be used for herding livestock. A "header breed" is a description of all working breeds who move to the head of the stock to gather them and bring them back to you. 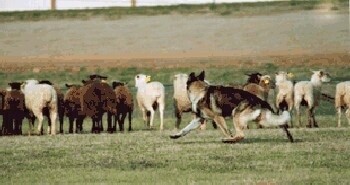 The term "drive" is used when the dog moves the herd away from you. Most working breeds naturally will either head (gather the stock to you) or drive (drive the stock away from you) and the majority of herding breeds can be taught to be both. Caution: Some herding dogs carry a MDR1 gene which makes them sensitive to certain drugs that are otherwise okay to give another dog, but if tested positive for this gene can kill them.